What is “truth” or “knowledge”? Can we have “alternative facts”, my reality vs your reality, or are ideas a simple black and white true or false? As with many things in life, the answer is both yes and no. It depends on what you mean by “truth” or “knowledge”. This is actually one of the most important questions to answer before having any discussion: What kind of knowledge are we talking about? It turns out that there are essentially two kinds of knowledge and they must be handled in two distinct ways. Mixing up the two creates very messy interactions involving a ton of confusion and often anger. Before you start criticizing or defending an idea, ask yourself whether the knowledge you are exploring is objective or subjective in its nature. These are sometimes defined as “facts” vs “opinions”. Although not wrong to define as such, these words can be a little dismissive of subjective knowledge and actually get you into trouble. Some examples will make this easier to understand. It should not be hard to agree that the reality of a dark skinned bisexual woman who grew up in poverty in rural Mississippi is very different to the reality of a light skinned straight man who grew up wealthy in the Hamptons. These differing realities are their subjective truths. Neither is “right” nor “wrong”. Now some people argue that ALL knowledge is objective or, conversely, that ALL knowledge is subjective – stay away from those people. Science, by definition, is concerned only with OBJECTIVE truths. The whole point of science is to remove the perspective of the observer to the point of finding inarguable descriptions of the natural world outside of the observers’ minds. Over the past several hundred years, the scientific method, while not perfect, has shown itself to be far and away the best process to go about identifying objective truths. There is no, “MY truth”, “MY science”, “MY bias”. If the process was conducted properly, there is no room for those things. The ONLY way for you to arrive at ANY conclusion other than the general statement “the earth revolves around the sun” is to throw out the scientific process. Now you can probably see that these are statements that really can’t be argued with (Pop Tarts are terrifying). They are true for that person and are based in feelings and emotions. The way we react when confronted with these purely subjective truths has to do with a reasonable level of tolerance. Let’s use the example of words making someone feel oppressed. If the word that makes you feel oppressed is “the N-word”, I think it is reasonable in this day and age to be upset with someone using it, whether or not you are personally offended. It would also be reasonable to conclude that the white person who just used the word is happy to be considered racist and we can judge them as such unless the context is extreme (comedians like Louis CK and Neal Brennan have expertly explored this context and use the word in their acts). If the word is “moist”, however, that is on you, no matter how offended you may be. Or am I an insensitive monster for using that word? I do recommend people be careful when taking offense. Make sure that it is not just you personally taking offense. Sometimes taking offense is its own method of controlling others making it a tool of oppression itself. In a previous post, I talked about things like institutional racism – a situation where people who are NOT RACIST unintentionally act in such a way that results in racial oppression. I was very clear to point out that the individuals are NOT RACIST, but collectively the system is. The problem is ignorance of those subjective truths creating a power differential. This also goes on with institutional sexism as well. What people must understand is that things that are subjectively true for you may not be subjectively true for others. Otherwise we end up with “You’re sexist!” followed by “No I’m not!” Both are right. Both are wrong. Nothing is accomplished. Notice the phrase “please understand” in both statements. We all fumble through the world stepping on people’s toes from time to time typically from the position of ignorance. That doesn’t mean you keep stepping on other people’s toes or sit back and take getting your toes crushed. You try to find understanding. Try not to categorically and permanently judge and label people because of your own offense. Unless they used “the N-word”. Those people are probably racists. I was just pretty clear that subjective truths are a real, legitimate thing. They are basically beliefs that can’t be explored by the scientific method because they are subjective and poorly defined. One thing with subjective knowledge is that it should always result in an attempt at understanding and reaching a compromise. When it comes to subjective knowledge, we should try to stay out of each other’s way. Individual perspective is at the heart of the point at issue. Although Mary may feel insulted or offended by the disagreement, those feelings are irrelevant to the point at issue. She is not actually being oppressed here. We are talking about objective knowledge. She is demonstrably wrong. Compromise is not at all useful. The nice thing about objective knowledge is that it exists independently of our feelings and beliefs. That means that there is a way to compare notes, check the process, challenge the ideas, and find agreement instead of misleading compromises. And that is done through the scientific method, a process specifically developed to separate objective knowledge from our subjective perspectives. Challenge the process, not the claim. We don’t rely on our feelings. Unless they used “the N-word”. 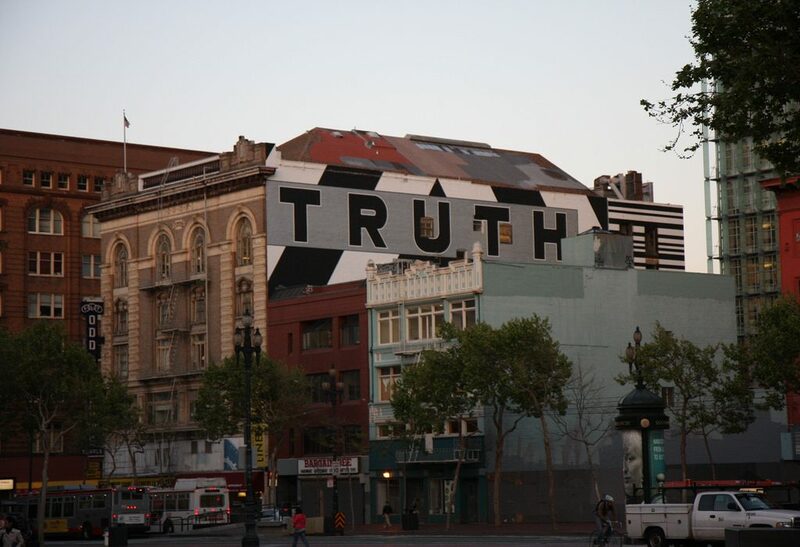 The featured image on this post is “TRUTH” by Nathan Rupert via Flicker.